Home Tags Posts tagged with "botanic trousers"
I went to Japan last year and the street-style there inspired me quite a lot. 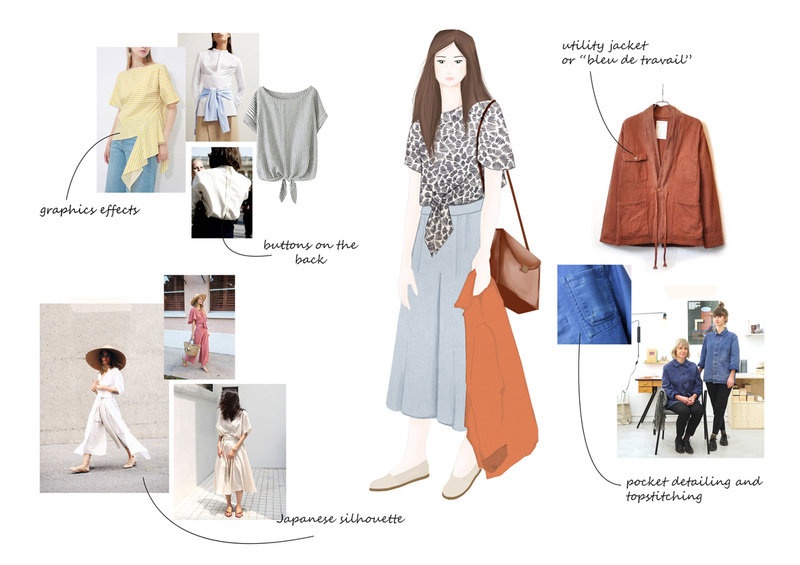 Particularly in Kyoto, where most women would be wearing the same outfit over and over: a loose top or jacket, a beret and some loose skirt or wide-legged trousers above the ankle. There was something very chic and casually elegant about this combination and I became obsessed with the silhouette. Sources : Denia, Tello and Botanic inspirations. The patterns volumes of this collection are directly inspired by this travel and all the things I have seen there. 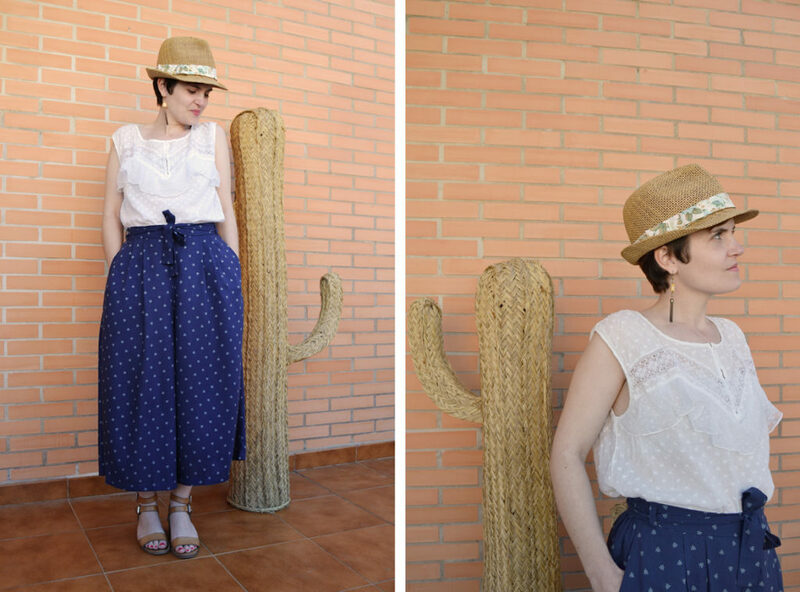 I chose loose and destructured lines for Denia and Botanic patterns in order to get easy to wear garments with style. According to the fabric, colors and patterns you choose, there are a lot of opportunities to make different options and wear them! The Tello Jacket is directly inspired by the utility jacket: my grandfather wore one almost everyday during my childhood! I decided to use the same base and make some changes in order to offer a modern take on this great jacket. These are all the inspirations that lead me to create this chic and casually elegant Japanese-like silhouette. Perfect for the up-coming summer… and later as well! How about you? How do you come up with your sewing projects inspiration? Trips, colours, shapes, magazines… Let me know! 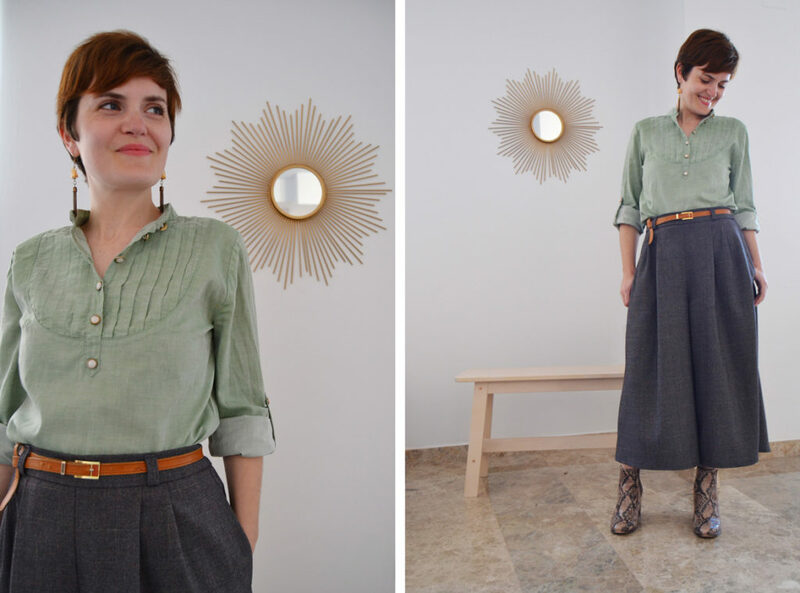 A new trousers pattern for Spring, hooray! Meet the Botanic trousers, your perfect companion for the warmer months. This pair of wide-legged, high-waisted trousers are so comfortable you’ll want to live in them every day (I know I do!). 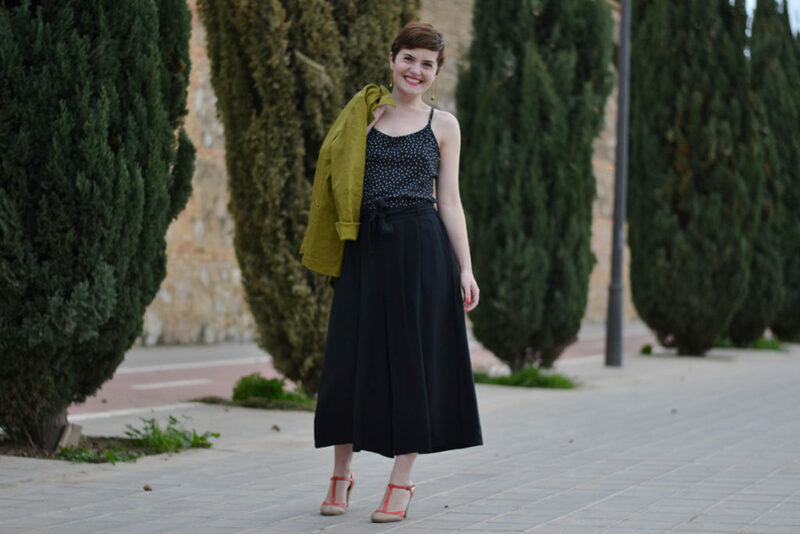 When I started designing the Botanic pattern at the end of 2016, culottes were seen in editorials or high-fashion magazines but not so much on the street. But this season, they’ve started to pop up everywhere! I certainly don’t mind as I love this style. Botanic trousers are very flattering and create an elongated silhouette thanks to the cropped-length. They are designed for an average height of 5 ft 5 (1m65) and the hem should hit between mid-calf and just above the ankle. The waistband sits at the natural waist and the front waistband is flat with two folds on each side for a smooth and clean line. Pockets are hidden in the side seams. But the best feature is the elastic back waistband: not only is it comfortable but it allows for a fitted waist without the need of any closure. The belt loops allow you to add the self-fabric removable belt or a belt of your choice. Choosing the right fabric for the Botanic trousers is very important: drape is the key word! I recommend going for a light to medium weight fabric with a lot of drape such as crepe, viscose, linen, light wool, silk… You also need a piece of interfacing for the waistband. For the presentation version, I’ve used a beautiful viscose fabric in black. It is really soft, comfortable, light and with a great drape. A few days ago, I showed you several Tello jackets on my instagram story. It was a great way to show the possibilities of this model in other fabrics and colours. In the same way, I was thinking of sharing with you the Botanic’s versions I made while testing the pattern. This is a test version I have worn all winter. The fabric I’ve chosen is a checked wool blend purchased in a beautiful haberdashery situated in Valencia, Bye Bye Manoni. This fabric is a perfect fit for these trousers. It looks great with sneakers for a casual week end outfit or like this, with boots and a shirt for work. I was thinking that a light printed cotton fabric with ethnic influence would be a nice idea for a Botanic spring version. This viscose is from Henry Henriette but does not exist anymore… However, you can find more printed viscose in their online shop. I think I’ll be wearing this one during all summer, it’s so light and breezy! So, which one is your favourite version? The Tello jacket is a classic utility jacket, unlined and with many pockets. It features a topstitched collar, one piece sleeves with dart, one vertical zipped chest pocket with lined inferior and one patch pocket, large hip pockets and six button closures at front placket. This model is available in paper and PDF format. The Botanic trousers are wide-legged with a high waist and cropped length. They feature a double-pleated front, pockets and a removable belt you can tie according to your own taste. The waistband sits at the natural waist and has a flat front and elastic back for comfort, no closure needed. This model is available in paper and PDF format. 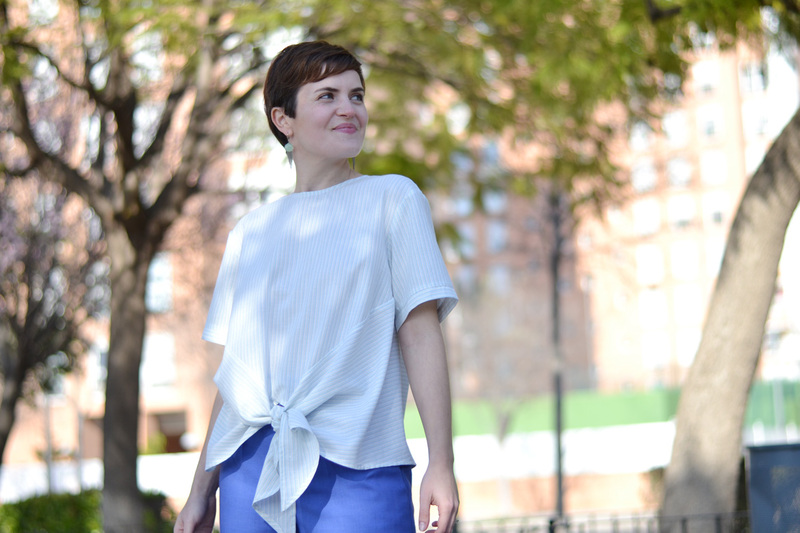 The Denia blouse is loose-fitted, with a round neckline and short cuffed sleeves. It ties in the front and closes in the back with buttons. This model is available only in PDF format.